Hunt To Read: Introducing "Know Your Hunt to Read Authors"
What a week it's been! I think feedback to the new series has thus far been overwhelmingly positive. I mean, if nothing else, you can't beat the price, right? In true Ron Popeil fashion, "But wait--there's more!" We have one more new series to introduce: "Know Your Hunt to Read Authors." Most Fridays, we'll feature an author whose book is on Hunt to Read. We'll have a few questions for them about writing and their book(s), and then we'll open it up for questions in the comments. We think this will be a good way for writers and readers on the site to interact in a largely positive manner. 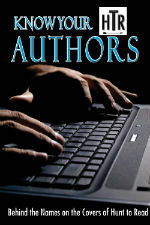 4) The subject line: "Author Series." It's a chance for readers to get a flavor for a writer's style, humor, and personality, and a way for our writers to get their names out there a bit more; if nothing else, you should get some valuable feedback on your book presentation the day that you're featured. Again, first-come, first-served, follow the guidelines above, and you can be featured on Hunt to Read. Sounds good? Great! Hope to see a lot of folks dropping by to meet the folks behind the names on the covers shortly.